This is a fresh, crisp relish whose icy greens are just beautiful to look at. I serve this as a salad with creamy Thai coconut curries and any other time I want a salad that will clear the palate. It is simple to assemble and keeps well. Submerged in its brine, the cucumbers will keep for up to a week in the refrigerator. The relish requires no special ingredients and can be assembled in less than 15 minutes. It is best served cold after marinating for a few hours. Like heat? Add more chilies. I have been known to add small amounts of chopped peanuts and freshly chopped cilantro. 1) Combine vinegar, water,sugar and salt in a medium saucepan. Stir over medium heat until sugar and salt dissolve. Set aside. Cool. 2) Peel cucumbers if you wish. Cut them lengthwise into 4 long strips. Cut each strip crosswise into bite size triangles. Combine with shallots and chilies in a small bowl. Add cooled dressing. Can be served at room or chilled. Yield: 3 cups. I love the chilis in here, it really livens it up. Selba, the relish needs heat and the beauty of chilies is that you are in control. Oh this sounds terrific and refreshing with a hint of spice. Yum. I like the idea of the chopped peanuts too!! WOW, this relish would be really good on fresh grilled bratts. I love this! Thai food is my favorite, especially when there are cucumbers involved! Such a great side to wake up the palate - perfect for the warming weather. Hi Meg, I just wanted to welcome you to One Perfect Bite. I hope you'll visit us often. First, this is gorgeous, it sings of Spring! I love the right amount of heat, just enough to stir your tastebuds. The chilis probably make it extra special. Looks delicious. This looks so refreshing. Wish I had some cukes in the refrigerator.. I'd make it right now! Mary thank you for stopping by to see me. This salad looks so fresh but, it does look spicey. I am such a wimp about hot food. But DH would love it. Charlene, thanks for stopping by. It's possible to divide the relish into his and her servings. One seasoned, one not. 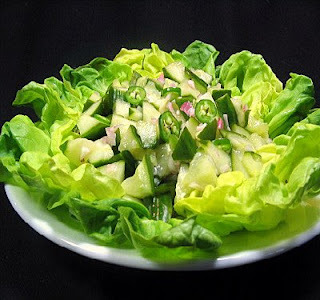 The salad looks so good(and spicy).My mom loved adding crushed ginger along with chilies to cucumber salads. Mrs. McGill, my artist friend, makes this for me every time I come over! It's so neat! I love this relish! It looks crisp, fresh and delicious! Ashley, welcome to One Perfect Bite. I'm delighted you stopped by. I make something similar, but without the chilis; that would really add a great kick of flavor! Your photos are always so beautiful! 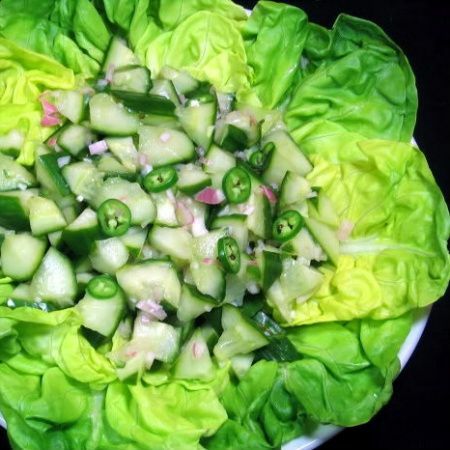 That is my favorite cucumber salad--I serve it with almost anything. Your photos are gorgeous. This relish sounds wonderful and refreshing - love the spice! I have made this before, but without the chiles. I like to eat it with the uber spicy food. Beautiful picture! Mary that salad is gorgeous! Mary this is not the time of day be visit your blog. Oh gosh how great that would be for supper.What a beautiful relish recipe. Thanks for stopping by with such a sweet message. Love cucumber...great for the Summer. The pictures are great! Juliana, I'm so glad you cam by. I hope you'll returen often. Is this recipe safe for canning?